Mohamed Naguib was Egypt’s first president after the July Revolution of 1952. He was quickly overshadowed by Gamal Abdel-Nasser; and it seems as if he continues to be neglected. After living through very difficult times when he was forcefully removed from power after the March 1954 crisis, the home where he spent nearly three decades was finally confirmed demolished by the Ministry of Culture’s Urban Coordination Agency (UCA). It is the home of Zeinab Al-Wakeel, the wife of Wafd leader Mustafa El-Nahhas, whose heirs had recently repossessed the property thanks to a court ruling. They sold it to an investor who tore it down despite pleas by Cairo Governor Osama Kamal to Qalyoubiya Governor Adel Zayed to put a moratorium on the demotion. UCA head Soheir Hawwas said the agency sent an inspection team to the property which confirmed the demolition although the building is subject to Law 144 of 2006 which protects architecture of historical value. These premises after all witnessed the key events in Naguib’s life. Hawwas added that UCA contacted Governor Kamal to halt the demotion but he was surprised to find out the home was located in Al-Marg district, since the palace was located near Mu’asaset Al-Zakat Street, technically under the jurisdiction of Qalyoubiya governorate. She wondered how the palace could have possibly vanished from the official inventory. Major General Mohamed Al-Kiki, secretary general of Qalyoubiya governorate, refused to comment on the issue, saying he was too busy in a meeting with the Minister of Local Development. According to Naguib’s biographer Rifaat Yunan, Egypt’s first president was place under house arrest in November 1954 after his relationship with Nasser deteriorated following the March crisis, because of Naguib’s staunchly democratic stance and desire for for the army to “return back to its barracks”. Free officer Abdel-Hakim Amer, later the commander of the army, told Naguib that his stay at Zeinab Al-Wakeel’s home would be no longer than a few days, but the deposed leader ended up staying there for nearly 29 years. Yunan says Naguib felt that living in this house was a “descent into Hell”: it was guarded by 20 guard posts and its the garden was stripped of trees for security reasons; all the antiques and furniture in the palace were removed, including refrigerators, kitchen utensils, pots and pans. Even Naguib’s own medals, shields and military diplomas were confiscated. The former president documented all these painful developments in his memoir which was eventually published. In the 1980s, in the wake of several court cases lifting state custody, Al-Wakeel’s heirs demanded that the palace should be handed back to them. A court ruling was issued to this effect, but ousted President Hosni Mubarak agreed to assign Naguib and his family an alternative apartment where he was to live until his death in 28 August, 1984. Naguib had wanted to die in this villa because, despite its hellish associations, he had grown incredibly familiar with its every nook and cranny. Yunan describes the state of the property the last time he visited it while researching his book, saying that it had fallen into ruin. The doors and iron decorations were rusted over and severe neglect had transformed the garden that was once plush with rare plants into a junkyard. Naguib had converted the basement of the villa into a large library including thousands of books. The first floor was a hall with an old dining table that led into a poorly furnished room where Naguib’s maid Hagga Fathiya continued to live. The hall also led to Naguib’s bedroom as well as a balcony that had become a chicken coup despite housing a bronze statue of Saad Zaghloul. In his memoirs, Naguib reveals his skill at raising animals in the garden. Even under house arrest, the former army general did not escape the plots of the Free Officers. He was kidnapped in 1956 and taken to Nagaa Hamadi then Tama in Sohag, only to be returned to Al-Marg once again. He was not allowed family visits for six years. Naguib could have been erased from the nation’s memory if it wasn’t for the wise intervention of those who persuaded Mubarak to name the underground station near Bab El-Louq after him. But the villa where he wrote his book I Was Once Egypt’s President and whose walls echoed his muffled cries found no one to save it in end. consequences of the 1952 officers coup-de-etat. Naguib's revenge for being the prisoner of 'ZENDA'finally came the morning of 5th of June,1967. God may fogive but never forgets! "The Boss" by St.John Roberts gives a vivid account of the intrigues that were going on in Egypt during 1952-55.Nonetheless Neguib was a father figure who became a victim of circumstances due to the intrigues of a fanatical political outfit which wanted to hijack the Revolution of July 1952. Consequently Gen.Neguib became a scapegoat. However he was neither sentenced nor liquidated as it has happened in many other countries but was kept under house arrest for a pretty long time until President Sadat ordered his release. Nonetheless Gen. Neguib was a statesman of noble character who was caught under cross fire and became a victim of tragic circumstances. Why do we continue to call it the '1952 Revolution' when it was quite clearly a coup? 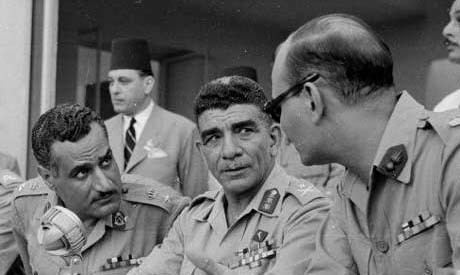 Perhaps things would have turned out differently if Mohamed Naguib had had his way but Nasser's ascent to leadership represented the start of a dictatorship - the replacement of one totalitarian leader, the King, with another. They wrote the history books but we should know better than to call it a revolution! Soviets armed Nasser in hope to control ME oil one day-this exactly what they are doing with Iran now. US armed Israel and attacked Egypt by its 5th Fleet in 1967. Infamous Nasser socialist regime collapsed and Sadat understood the geopoltical game. He expelled the Soviets before fighting Israel in 1973 War and win back Sinai. In response, religious fanatics killed him. Sadat is our national hero. Thanks AO for dispensing Facts. Infamous Nasser wase ungrateful even to USA President Eisenhower. He ordered UK/France/Israel to get out of Egypt after 1956 in exchange for Egypt to be friendly to US. Infamous Nasser backed on his promise to USA . In response, USA started arming Israel to counter Soviets during Cold War Era. !